1 Establishment of IIT/NEET coaching centres in 4 Morarji PU Residential colleges for backward classes at the Divisional Level; grant of Rs 4 crore is provided. 2 Construction of own buildings for 100 student hostels of Backward Classes Welfare Department, which are running in rented buildings; grant of Rs 40 crore is provided. 3 Construction of Nomadic Community Halls to enable them to organize their community programmes and to undertake a study of their tradition, culture and practices; Rs11 crore is provided. 4 Building a Amarashilpi Jakanachari Sculpture Centre with a grant of Rs 10 crore at Shivarapattana in Malur taluk of Kolar district. 1 A grant of Rs 30,445 crore under Special Component Sub-Plan and Scheduled Tribe Sub- Plan. 2 Building a 'Samyuktha Student Hostel' for Scheduled Caste/Scheduled Tribe/Backward Class/Minority and General Category students in each of the 30 districts; grant of Rs100 crore provided. 3 Upgradation of 100 Residential Schools of Karnataka Residential Educational Institutions Society with PUC (Science and Commerce) courses. 4 Establishment of a large ‘Constitution Museum’ in Bengaluru city to introduce the genesis and importance of our Constitution to the future generations; Rs 20 crore is provided. 1 One time allocation of Rs 25 crore grant to establish Moulana Azad Trust to encourage modern education and scientific temperament among the Muslim community. 2 Opening of 5 Morarji Desai Residential Schools for Girls at Davanagere, Tumakuru, Gadag, Dharwad and Kalaburgi district; grant of Rs 20 crore is provided. 3 Enhancement of the admission strength by 25 each at 25 post metric hostels and by 60 at 20 Morarji Desai Residential Schools in the State. of 5000 classrooms, Distribution of learning equipments to 1000 schools and appointment of one Estate Manager for the maintenance of school buildings. 2 10 days training to 1 lakh teachers under ‘Guruchethana’ programme. in school administration; preparation of Block level ‘Report card’; Teacher-Parents meetings to improve the performance of schools. 4 Action to improve learning outcomes; Teacher-Mentor programme to help teachers to learn more; Individual attention on children to reduce dropouts. 5 Establishment of 1000 Karnataka Public Schools in the next 4 years in Hubli Headquarters to provide education under one roof from pre-primary level to 12th class. Separate organisations and guidelines on Kendriya Vidyalaya Model. 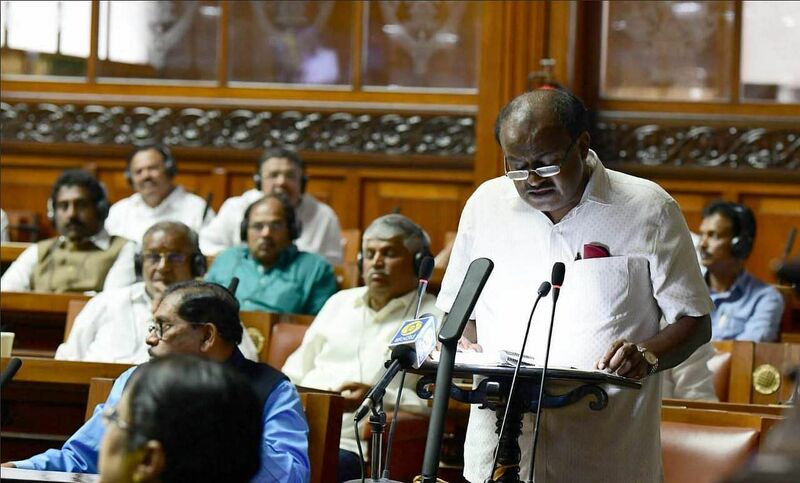 6 Establishment Well Equipped Language Skill Training Centres in Bengaluru, Mysuru, Belagavi and Kalaburgi Divisions in the name of Alur Venkatarao at a cost of Rs.2 crore to improve language teaching methodology. 7 “Spardha Kali” scheme to bring out hidden talent in Government High School students and to enhance their talent and competency and to prepare them for healthy competition and giving special training and guidance. A grant of Rs1.5 crore for awarding ‘Prathibha Puraskara’ to 20 top students scoring highest marks in National Talent Search Examination from every education district in the State. 8 Grant of Rs1 crore for digitization of S.S.L.C evaluation centres. Grant of Rs 2 crore to impart vocational training in chosen subjects to PUC students. 1 Adoption of new learning methods in higher education through Next Generation Learning Initiative in Bengaluru Central University. 2 Action to make CET examination conducted by Karnataka Examination Development Authority online. 3 Grant of Rs 2 crore for implementation of a system to distribute Aadhaar based digital marks card and degree certificates online to students and validation of the same. 4 Action to establish a new Technological University at Hassan by bifurcating Vishveshwaraiah Technological University in Belagavi. 6 Opening Training Centres in all First Grade Colleges and Universities to impart job oriented education. 7 Training in teaching subjects to all teaching faculty to improve the quality of Higher Education in the next 3 years. 8 Revision of pay and allowances to teaching and concurrent cadres working inGovernment/Aided First Grade Colleges and Universities as per the recommendation of the 7th Central Pay Commission. 9 Grant of Rs 10 crore for providing Laboratories/Workshop facilities in Government Engineering and Polytechnics.